Project Name: FtG UI Mod. Game Version: v1.03 - v1.04. 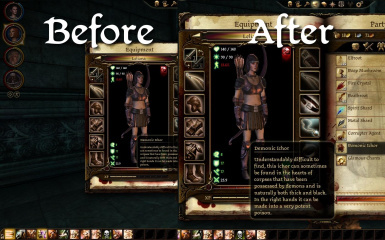 Release Date: August 3, 2010.
game's user interface and providing other enhancements. * If you find any, please let me know. * Character portraits not displaying the mana or stamina. * More crashing (reportedly during fights - may have something to do with pausing). * Virulent walking bomb lost its tooltip description. the dazip file "FtG UI Mod - v2.1.dazip". upcoming DLC. The mod should still be compatible with game v1.03. disappearing when the game had subtitles off. Reported by Porkdish. 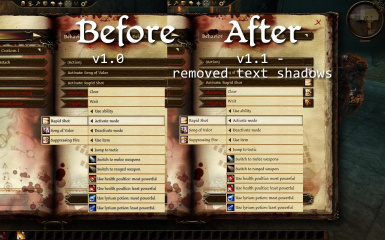 * Bug fix: Better minimum font size for the abilities and levelup description tooltips. and wordwrap doesn't account for it. Shouldn't happen with any official content. 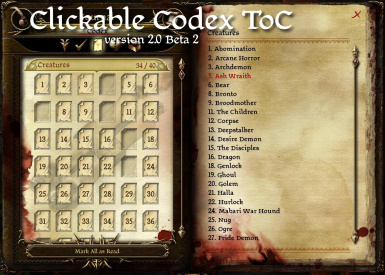 utility with the "Show Codex table of contents" checkbox under the Book Menus tab. This is an extensive feature to make finding Codex entries easier. again to unselect it and get the table of contents back. 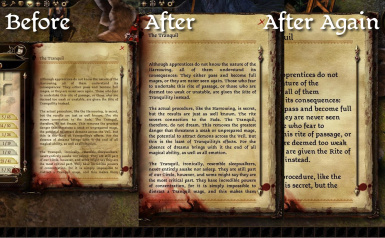 * Skills, spells, and talents description text now have adjustable font sizes and color. not scaled, then it uses the tooltips size. The ability description text is constrained so it will fit inside the non-scrollable area. unavoidable in order to keep the proper formatting. It's not anything too noticeable. but accessed in the config utility under the Floating Text tab. * The config utility now has an icon. Cosmetic change. * Bug fix: Ability icons dragged into the top navbar aren't erroneously scaled down anymore. 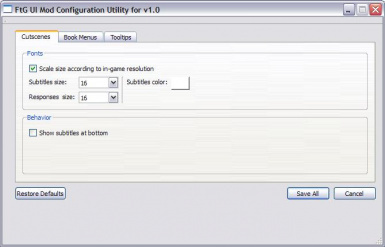 unchecked under "Book Menus" in the configuration utility. 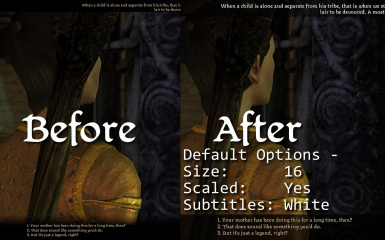 * Bug fix: Restored lowered subtitles option. likely to elide the text. * Rewrote to support the upcoming Awakening expansion. Now requires game patch v1.03. 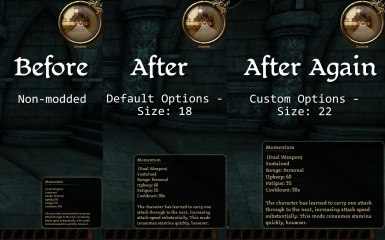 * Adjustable font sizes no longer depend on whether the containing UI element is scaled or not. you select a larger font size for it or select the new "automatic" size. * Added default "automatic" font scale sizes for the journal and tooltips. Reset any earlier configuration with "Config\FtG_UIMod_Config.exe" for these to be selected. reduce how blurry it looked. where it is - which could easily happen if included in a mod pack.